Astronomy has experimented a data deluge in the last decades. Current large scale surveys like the Sloan Digital Sky Survey (SDSS) and the Dark Energy Survey (DES) increased in many orders of magnitude the volume and complexity of available astronomical data. This situation will be even more drastic in light of the upcoming Large Synoptic Survey Telescope (LSST), which is expected to detect 2 million transients per night. In this scenario, it is paramount that astronomers are familiar with automation techniques which allow full data exploitation. In these two lectures, I will give an introduction to basic machine learning principals and give examples of their application to astronomy. 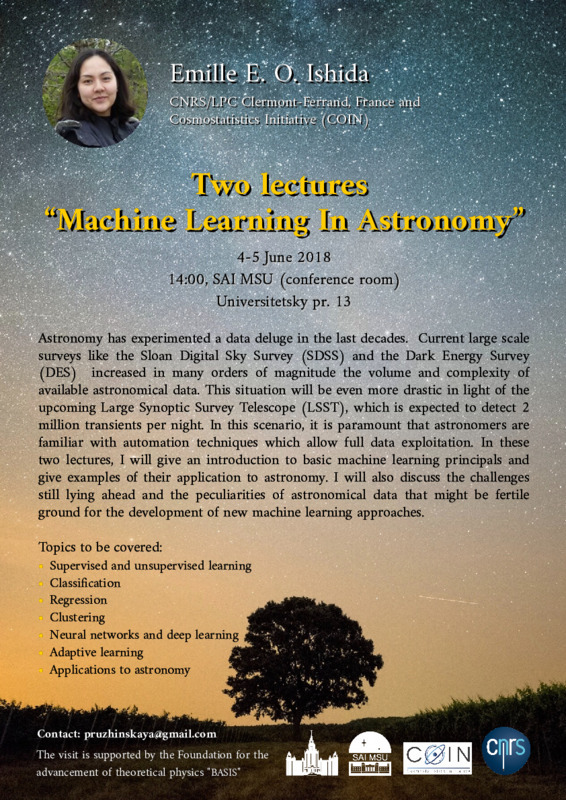 I will also discuss the challenges still lying ahead and the peculiarities of astronomical data that might be fertile ground for the development of new machine learning approaches.